Allen inspires fellow children to dance along at the Hawai'i State Art Museum Lawn, 12/04/09. 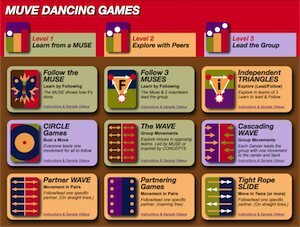 In this Follow the Muse Dance Game, whoever dances in the center position is the lead dancer also called the Muse. The dancers and audience follow loosely. In this game the Rotation Call of 'Huli Huli', moves players one position clockwise. As players land in the center Muse-spot, they take over the lead. The other two players are inspired by the Muse's movements. There is no need to be precise. MUVE dancing is about having fun and exploring creative dance moves. Go ahead and dance along to this video right now.